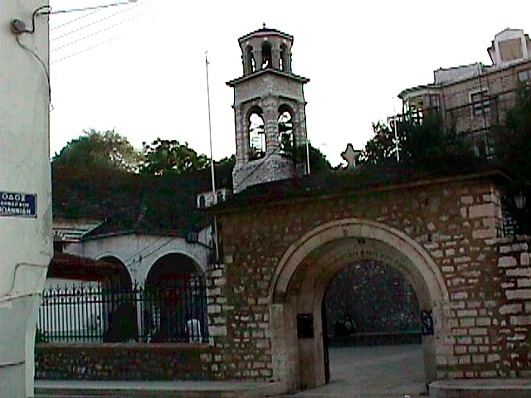 The Metropolitan Church of St. Athanasios βis close to the Metropolis of Ioannina and at Metropolis street in the city of Ioannina. We know that is was built before 1611 and was saved by the revolution of Dionysius the Philosopher. It was burnt in 1820 on 25th August. The today’s church was inaugurated in 1833 and it is a piece of work of the builders Liolis and Dosis from the village Vourbiani of Konitsa. The building is made of balck and white stone. The architecture of the church is basilica, of three spaces with domes. Charecteristic of the church is that its floor is at a lower level than the ground. Its iconostasis of walnut tree, the dome and its pulpit have carved pictures of animals and plants. The traveller Strangford mentions that the church is one of the most important sights in Ioannina. The wallpaintings of the church date back to 1835. The dome was built in 1816, while the belltower was built in 1905 by the architector Pericles Melirrytos and is made of carrved stone. The arched main entrance is also beautiful.